The Institute for the Environment and Sustainability is an umbrella organization for undergraduate and graduate education and research on the environment and sustainability at Miami University. This annual event brings IES alumni back to campus share their perspectives on career development with M.En. students and undergraduate co-majors. The annual Drs. Gene and Carol Willeke Frontiers in Environmental Science Distinguished Lecture series brings prominent figures in the field of environmental science to the Miami campus. 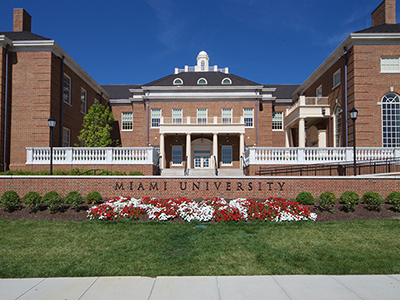 The IES partners with other groups at Miami University on several initiatives, as well as with local and federal agencies. Students are involved in all of these activities. The new Shideler Hall is an unprecedented opportunity for the Institute for the Environment and Sustainability to partner with the geosciences in the development of state-of-the-art facilities for students in the Master of Environmental Science program and the Institute’s three undergraduate programs in environmental science, sustainability and energy. Learn more about the Shideler Hall Renovation.